This post is sponsored by Mercury Insurance. In exchange for this post I was compensated monetarily. All opinions are my own. Do you have a teenager? Are you counting down the days until they can drive themselves to school, or go get you a gallon of milk from the store? Chances are, if you're reading this, you do have a teenager, but you're reluctant to begin counting down the days until they can drive. Let's take a trip down Memory Lane, shall we? Do you remember when you started driving? You and I simply had a car. There were no cell phones. Specialty radio stations weren't around for us to fiddle with. There were no back up cameras or GPS's. Todays distractions weren't around when we started driving. We, at best, had beepers. Remember beepers? While you were driving down the road, someone might "beep" you, you would either stop at the nearest pay phone or you would wait until you got home, to call the person back. Life was more simple. Now, think of todays distractions and add to that...drugs and alcohol. Thanks to Mercury Insurance for hosting a much needed event for every teenager. 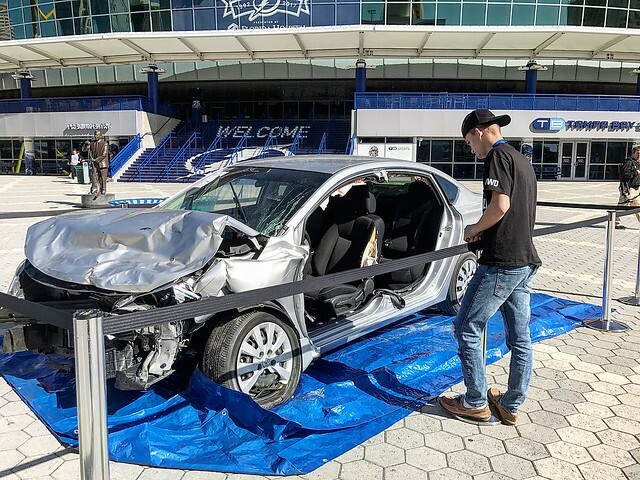 A couple of weeks ago, Jake and I travelled to Tampa, FL to the Mercury Drive Safe Challenge. Mercury was teaching participants how to to handle a vehicle when it begins to spin out of control. Participants were shown the safe way to slam on the brakes and avoid an object or obstacle in our path. 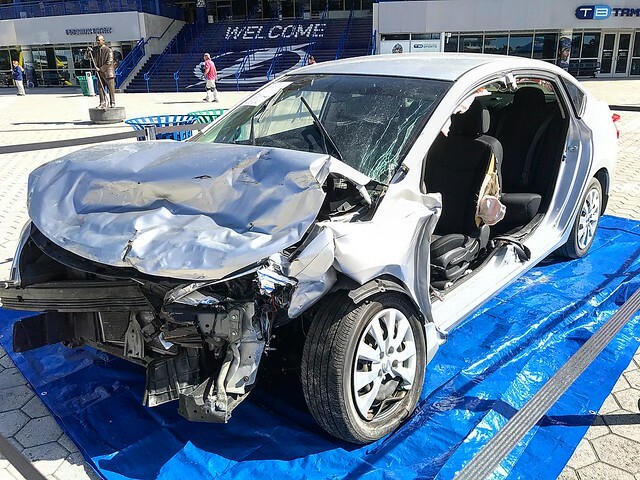 They also showed participants how distracted driving makes driving incredibly difficult AND dangerous. Two police officers from Tampa PD came in and spoke with us all on the importance of first, not drinking underage, but also not driving under the influence of drugs and/or alcohol. One of the police officers shared his story of being a victim of driving under the influence. He has lived with the scars, that he was once bullied for, and told how he turned those scars from shame to heroism, whether he sees himself as such or not. MADD also gave a presentation on the importance of abstaining from alcohol until at least 21, if you choose to drink at all. The vehicle shown in these photos belonged to a young girl who had to be rescued from her car with the Jaws of Life. 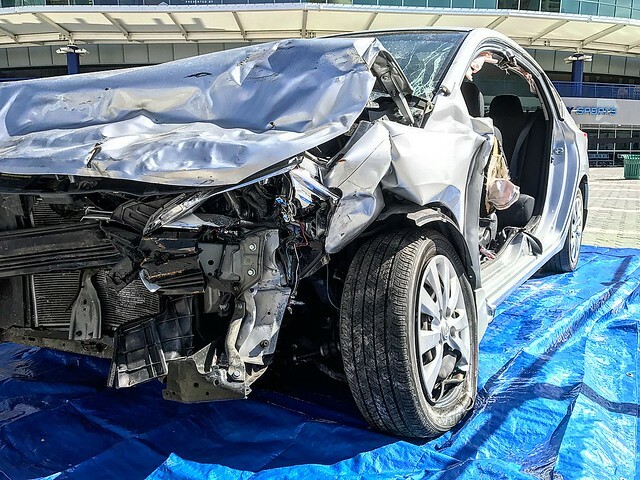 It was important to me for my son to reflect upon this vehicle and think about how important it should be to him to drive with ZERO distractions! (When he starts driving, of course.) Jake and I had a long conversation on the way home about everything we learned that day. Do you have conversations with your teenager on how important it MUST be to them to drive undistracted? Are you an example to your teenagers? Meaning, do you text and drive while they're in the car? Mamas, do you put your make-up on while driving? I'm guilty of all of it. But, I certainly have a different view on these things after seeing the statistics on such behavior. I challenge you to talk to your teens. Today. Visit Mercury Insurance to read and sign the Drive Safe Agreement. You can also read important statistics for driving teens. I assure you, they are eye opening. These stats will further drive home the importance of talking with your teen NOW. Unfortunately, it happens every day. Millions of drivers get behind the wheel and endanger themselves and the lives of others by shifting their focus to things other than driving. A text message. An Instagram post. Fast food meals in the car. All are not worth a life.